SSC is proud to be a supporter of Suicide Prevention and Mental Wellness in the construction industry. 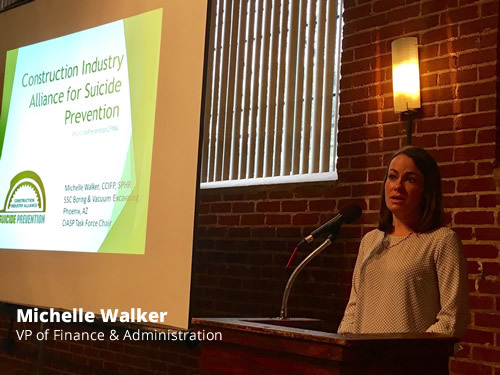 Michelle Walker, VP of Finance & Administration is chair of the national task force Construction Industry Alliance for Suicide Prevention. This alliance is bringing together over a dozen construction industry associations to help change the statistics of construction being the #1 industry for suicide death numbers. Construction is the number one industry for number of suicides and the number two industry in suicide rates. As such, it is an industry imperative to shatter the mental health stigma and create caring cultures within our companies.